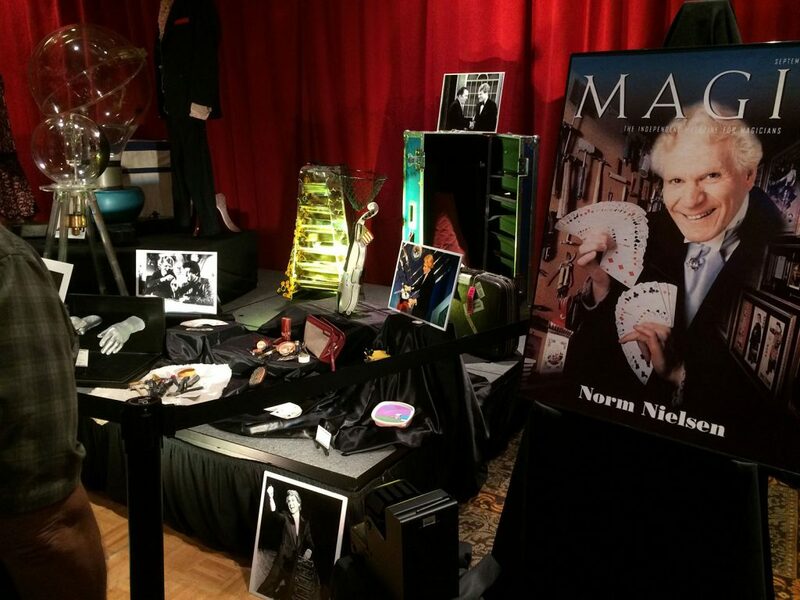 I just wanted to take a moment to express my gratitude and say THANK YOU to all of you who came by our Nielsen Magic booth at Magic Live last week. Although it was a more challenging convention this time for me than usual, I had a wonderful time, meeting old friends, making new ones, learning a little more magic and appreciating the life and experiences I have had at this point in my journey. It was challenging because this is the first time that I do the convention solo, without Norm being there all the time. At 82 years of age, he is now completely retired, and just enjoying the moments life brings to him as well. For me, Magic Live started last year, when we registered for the event. 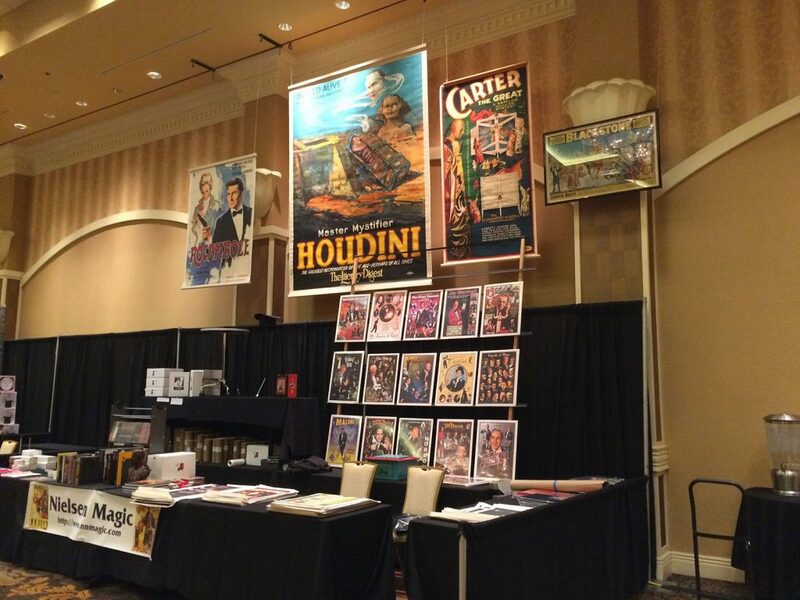 This convention is organized by Magic Magazine, one of the largest trade publications, based here in Las Vegas. This is their seventh convention – which normally occurs every two to three years. Being a dealer at this event is not easy. To get invited, one’s company has to advertise in their magazine for several months per year. 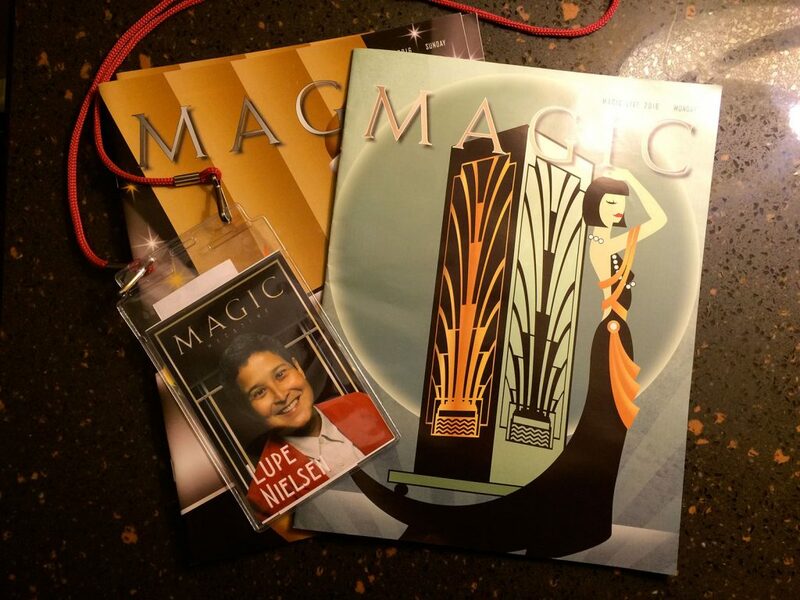 The reason the convention is called Magic Live, is because it is themed around the subjects covered in the magazine. The dealers’ room is full of their advertisers, and the concept that the magazine “comes to live”. You get to meet the writers, the reviewers, the people that have been on the cover, celebrities, etc. Two weeks before the event, we were busy stocking items for the convention, preparing our display, etc. 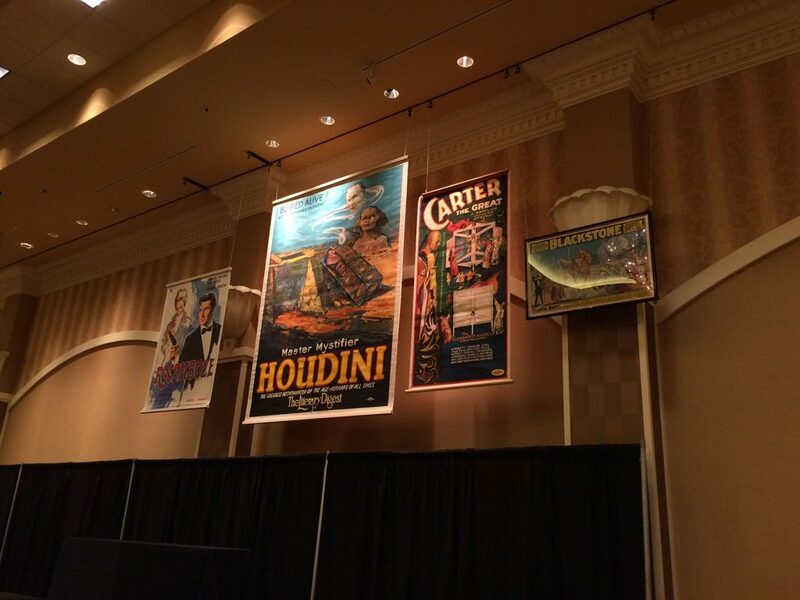 One of the products we sell are vintage magic posters and their reproductions. 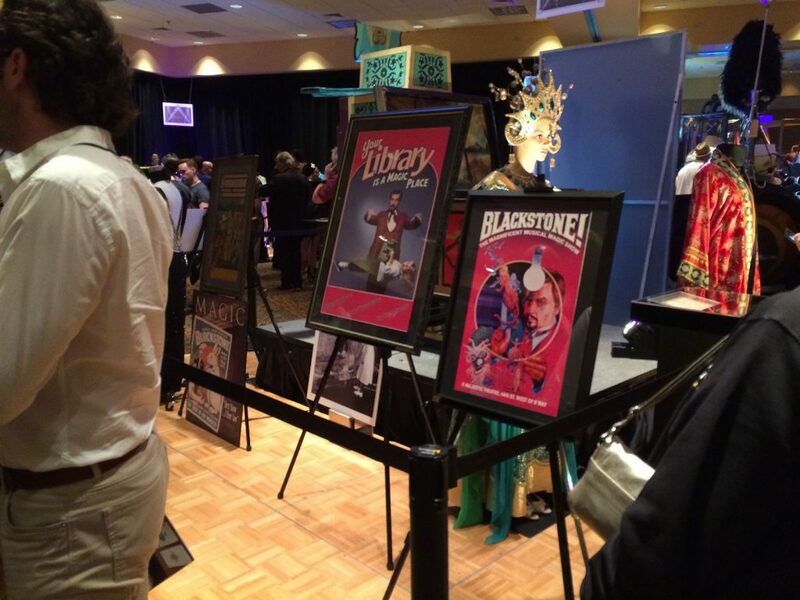 To make the display special, we prepared a few original posters in such a way that they could be hung from the ballroom ceiling. This procedure was done a day earlier, as the room was being prepared. 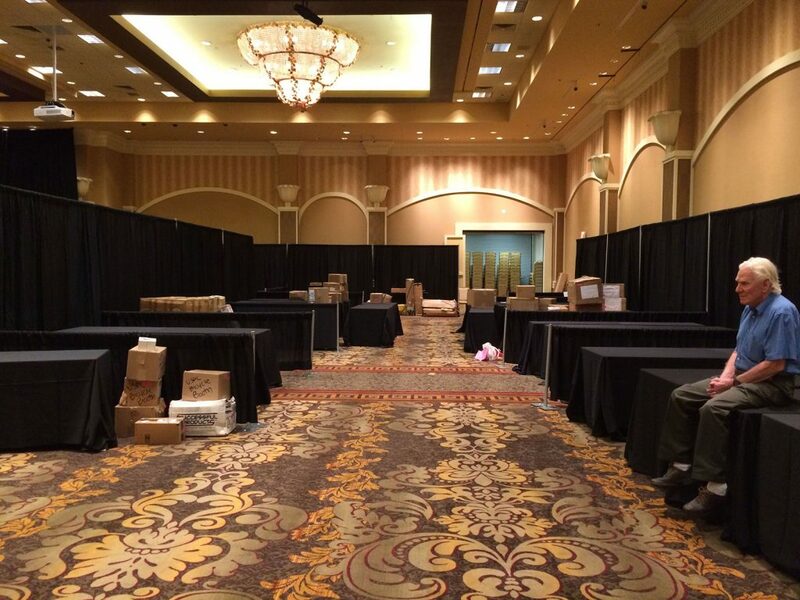 The Mardigras Ballroom at the Orleans Hotel, as seen on Saturday before the Dealers’ Room was assembled. We hung posters above our booth on Saturday morning, one day before the event. My Magic Live Convention name badge, and the programs for the first two days. 6:30 pm Dealer Meeting. We all stand around Kristee Watson and the Magic Magazine organizers, to hear instructions as to how the room will operate during the convention. This sign was outside the room. 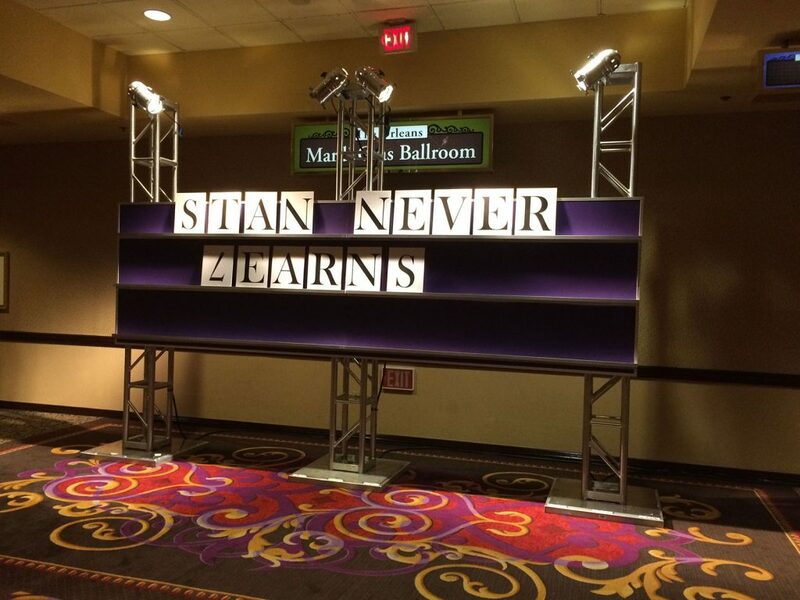 Indeed, Stan Allen (editor of Magic Magazine) does not learn. He is a tough boss, and for a year he and his staff carefully plan this event. As it is customary, the convention starts on a Sunday night with a huge opening party. There is usually a game puzzle given to the attendees to encourage mingling. This year people were giving parts of the puzzle and they had to meet others at the party to exchange pieces until they completed it. 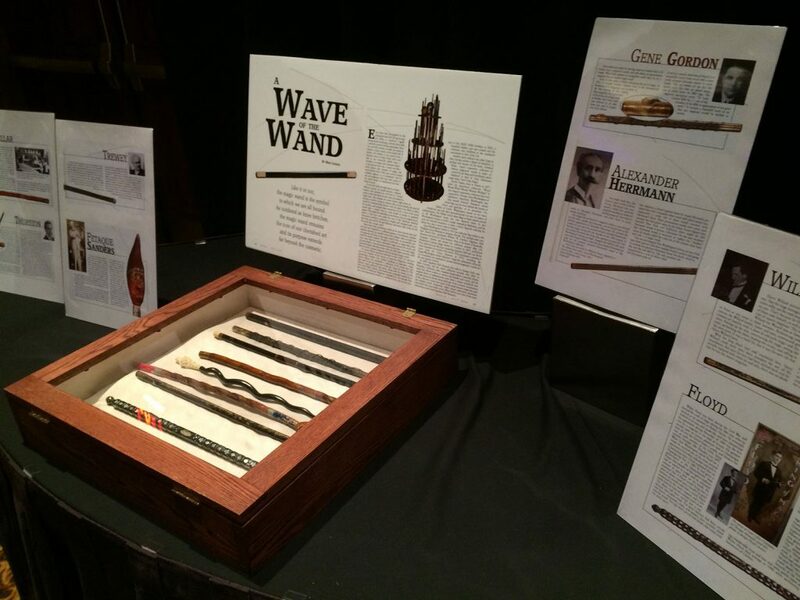 Along with the party, they open the “Magic Shop” and encourage people to make early purchases. The way they do this is by providing a raffle ticket for every $20 one spends at the fair. 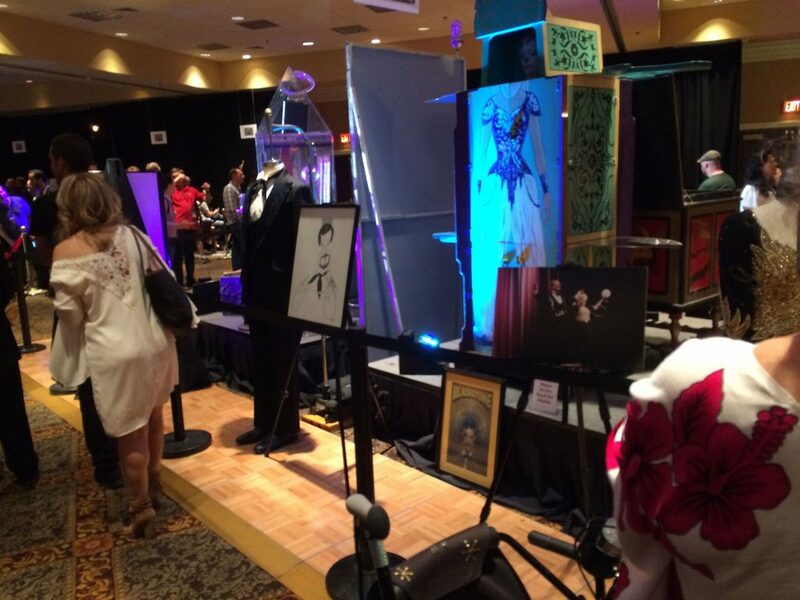 The prizes are amazing, each worth hundreds of dollars in merchandise and incentives. 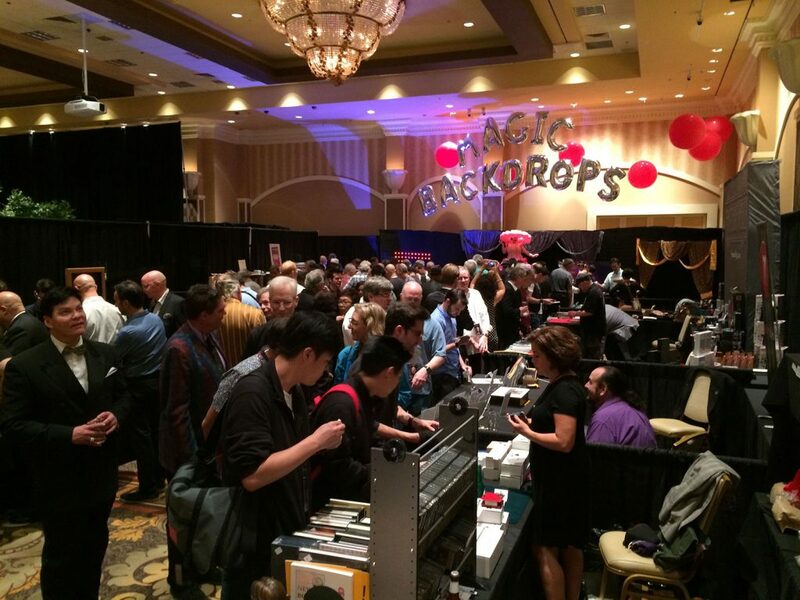 Pandemonium ensues at the dealers’ area with people shopping, greeting each other and having drinks at the handy cash bar. After spending nearly four hours setting up the booth, I worked from 6:30 pm – 11:30 pm at the booth. Our buddies Lynetta Welch and Alberto Telles gave me much needed assistance to handle the heavy traffic of the evening. Look at the number of people! It was this busy at 9:30 pm. The view from my perch at the Nielsen Magic booth on Sunday night. Lance Burton – He was the keynote speaker who spoke about the importance of sharing our magic knowledge with the younger generations. Young people are eager to learn and sharing improves the art of magic. 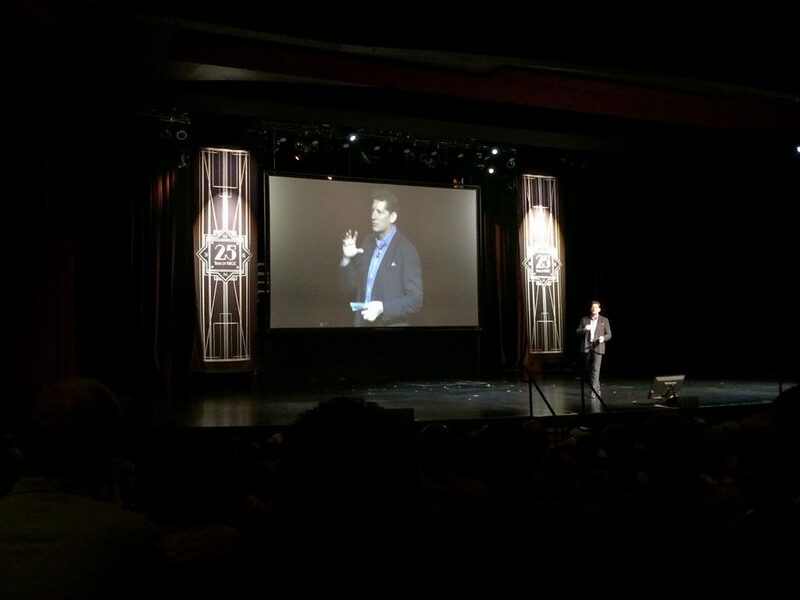 Lance Burton – Keynote Speaker. 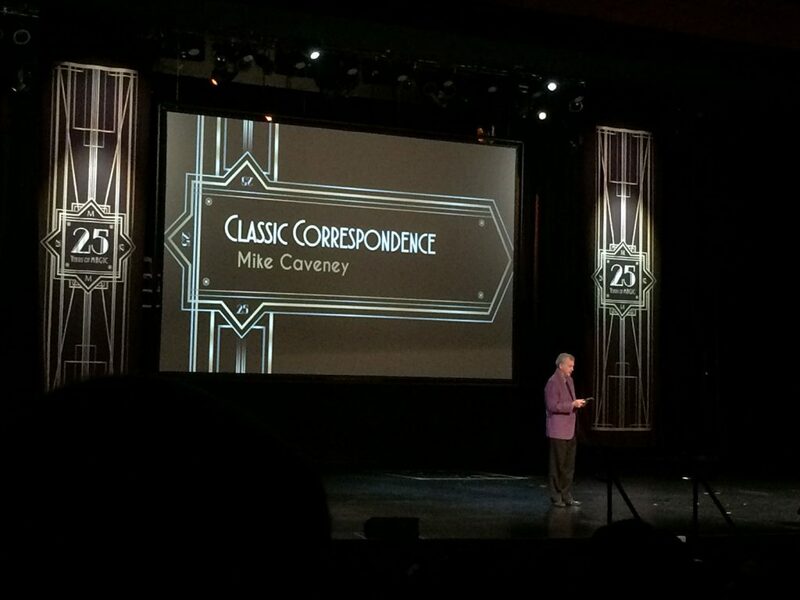 Mike Caveney – Writes the “Classic Correspondence” column in Magic Magazine every month. In the 1960s he, along with Stan Allen, performed as a duo act. The letter he shared with us was a five page letter written by Stan Allen to him while he (Mike Caveney) was in Paris, France. It was full of information about the magic scene in the clubs and friends in California. With the advent of electronic correspondence, writing physical letters has become almost nostalgic and a lost art. Luis Piedrehita – Luis is a superstar in Spain. He had his own television show for many years in Spain, where he was taped live performing different effects every week. Eventually he went into other projects where he started to combine magic with film. His pieces explore the absurdity and importance of the method to entertain audiences on television. Due to the two-dimensionality of the medium and the limited point of view of the camera, he explores new ways to see the world. He shows a magic effect, and challenges the viewers to figure out the method. The methods he reveals are seemingly “absurd” and hilarious. The methods are more entertaining than the effects. He does not expose the magic, instead he makes us look at the life in a magical way. 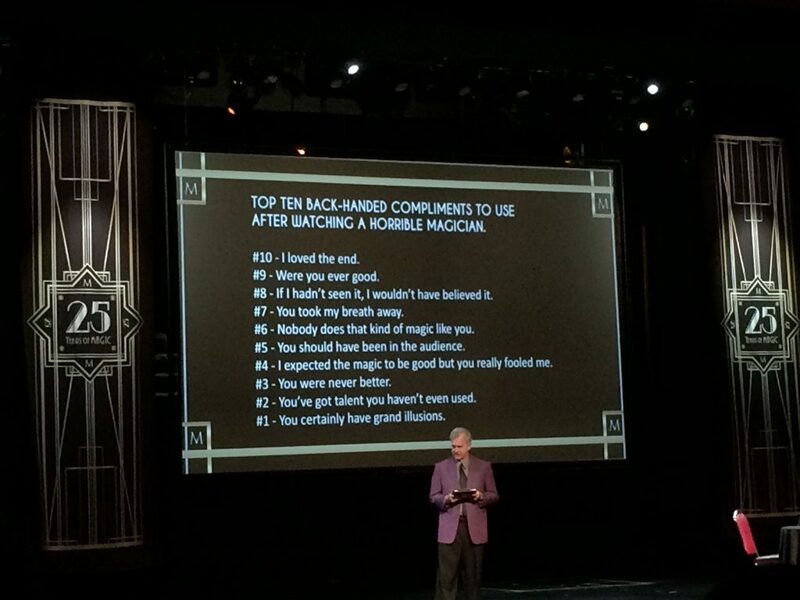 Mike Caveney came out again with a very popular list that was published in Magic Magazine in the 1990s: The Top Ten Backhanded Compliments After Watching a Horrible Magician. 10 – I loved the end. 9 – Were you ever good. 8 – If I hadn’t seen it, I wouldn’t have believed it. 7 – You took my breath away. 6 – Nobody does that kind of magic like you. 5 – You should have been in the audience. 4 – I expected the magic to be good, but you really fooled me. 3 – You were never better. 2 – You’ve got talent you haven’t even used. 1 – You certainly have grand illusions. Mike Caveney’s – Top Ten backhanded compliments after watching a horrible magician. David Penn – Magic Circle’s Close-up Magician of the Year. Lectured on how to bend the stem of a wine glass in the spectator’s hands. This is an effect worth learning and doing at special occasions. Michael Muldoon – Lecture on Magician’s without Borders. This is a magicians’ organization where performers bring the gift of magic and entertainment to the most remote and underdeveloped places on the planet. From war torn Bosnia, to El Salvador. It is proven that children learning magic improves their self-esteem and confidence. This is part of the gift that this organization provides. 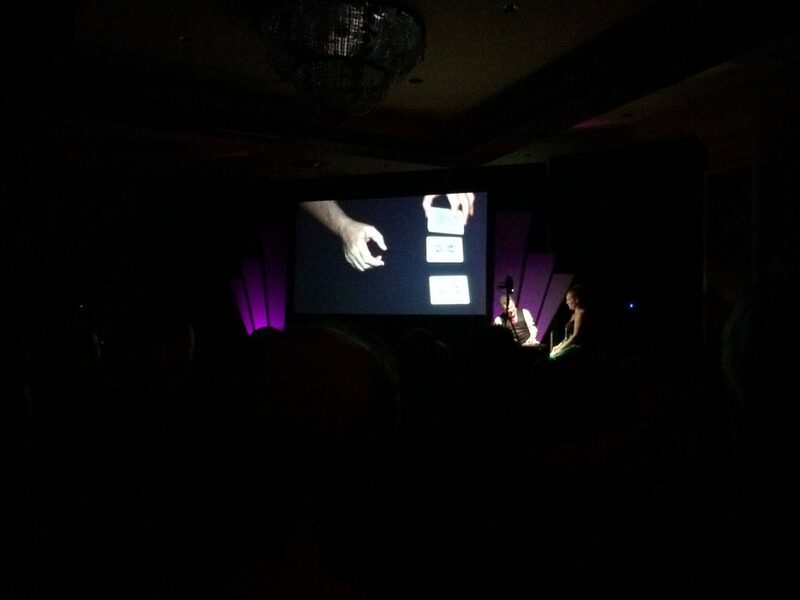 Kevin Phillips – Spoke about “The Future of Magic”,which was a comedic presentation using the art of double talk. Kevin was quite skillful in talking about nothing as if it were something important. He was hilarious! Max Maven – He used to write a very popular column in the magazine titled Parallax. He discussed the importance of caring about what we do. Magic is more than the acquisition of props. Your story is more important. 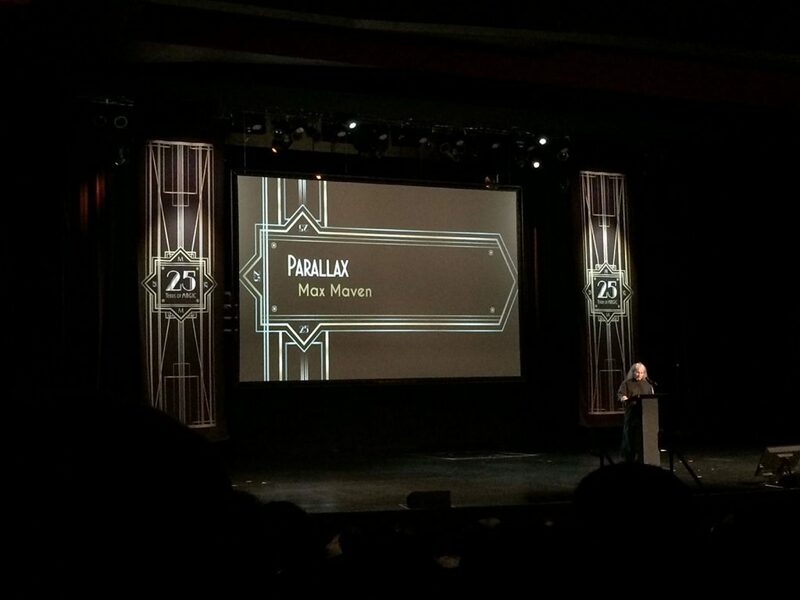 Max Maven – Parallax Section. 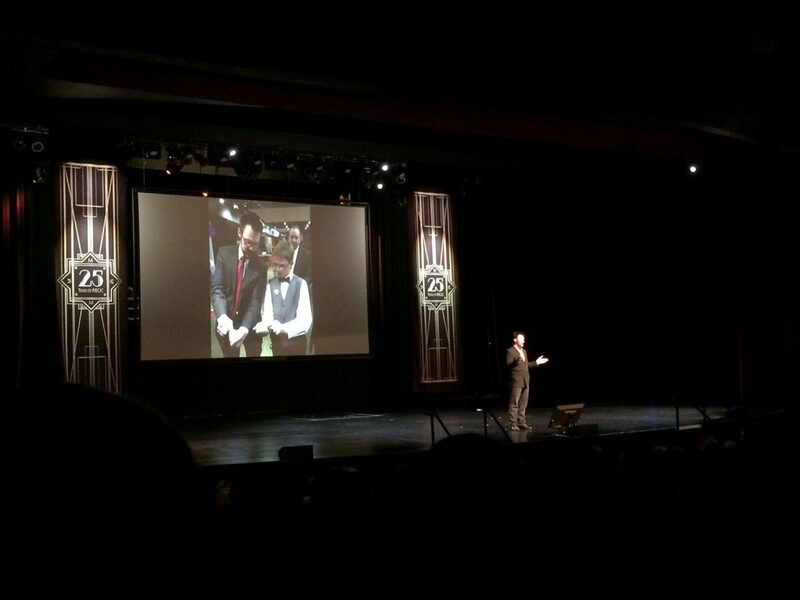 The last presentation was an In Memoriam video of all the magic friends we have lost through the years. I generally do not like this type of presentation, because I was fortunate to have friendships with 70% of the people portrayed on the screen. A tearful moment indeed. I spent the rest of the afternoon perched at our booth at the Dealers’ Room. 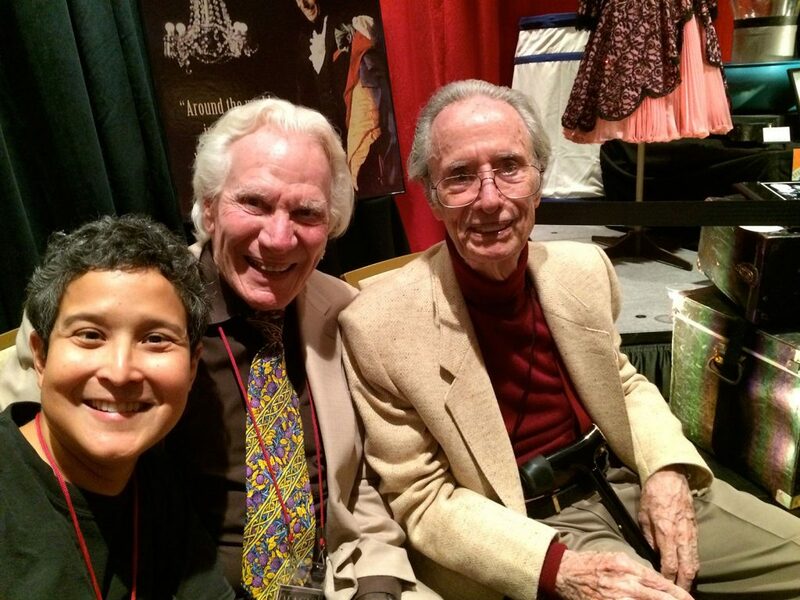 Joshua Jay, Richard Kaufman and Steve Reynolds – Flashback – They taught numerous card tricks. 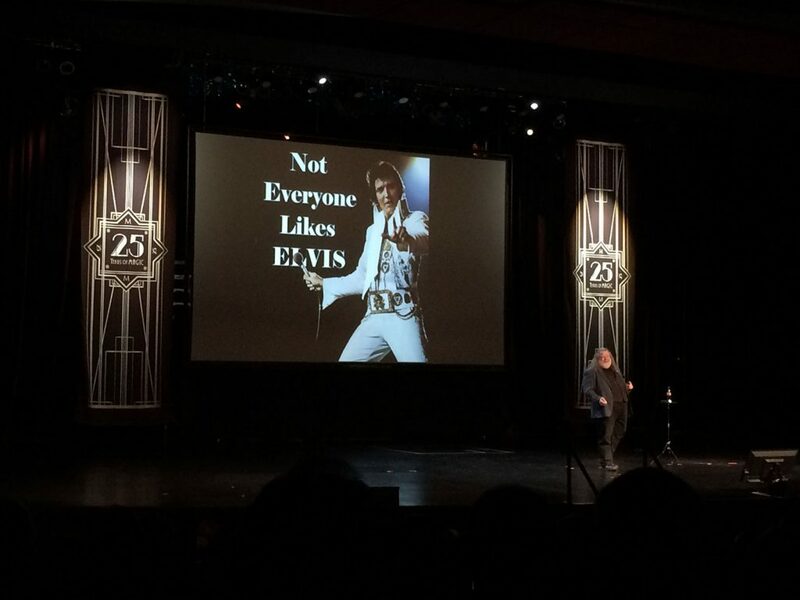 Never did the performer introduce himself or mention his name. After the show was over, I went around asking people what the name of the performer was, and no one knew his name. I found out his name about an hour later when someone happened to have a little program where his name was written on the back in a six point sized font. Because I did not know his name, I did not care for him during the performance. Although likeable, Mr. Haslam’s delivery was quite monotonous and lacking drama. He came across as a sophisticated highbrow British gentleman. The same tone throughout the show did not help me to stay awake during the performance. The Secret Class Show performed by Mark Haslam. Live On-stage I: The first stage show of the convention was quite nostalgic. The featured acts were those that we knew and loved from the late 90s and early 2000s. Stan Allen MC’ed and performed his Stuart the Rabbit Routine; Christopher Hart did his classic act with the Torn and Restored Music Sheet and the disembodied hand; Juan Mayoral performed his classic act ending with the walking ladies’ shoes effect at the end; Vic and Fabrini performed their award winning act of the magician with the mannequin robotic assistant; Jinger Leigh performed her version of the Okito Floating Ball; and David Williamson performed a hilarious routine with Rocky Racoon. Amazing Johnathan appeared briefly on stage as well as Mark Kalin introducing his lovely wife. The show was good, but by this time of night I was very, very tired to fully appreciate it. 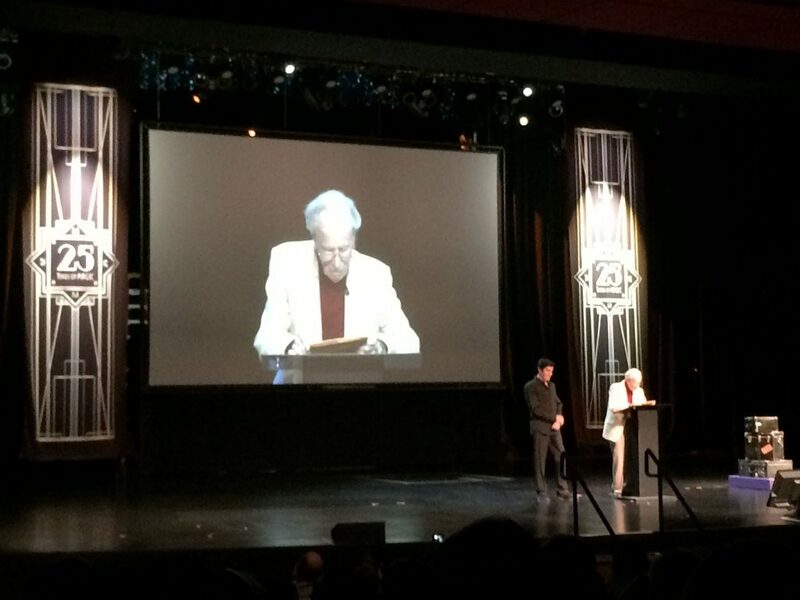 Stan Allen introduces The Amazing Johnathan on stage. 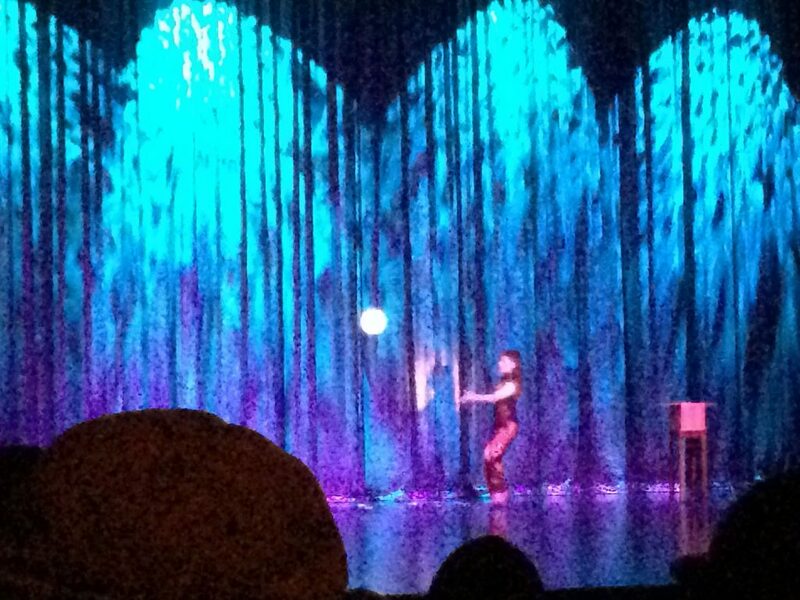 Jinger Leigh performs the Okito Floating Ball. Mat Franco – The winner of America’s Got Talent, and current headliner at the LINQ Hotel, was the MC and lectured on the use of using camera tricks to achieve a desired effect. Julie Eng – An accomplished magician from Victoria, British Columbia, talked about her life story, and her involvement with Magicana. She is the project director for this arts organization and charity, and through their social outreach, her group changes the lives of young and old. 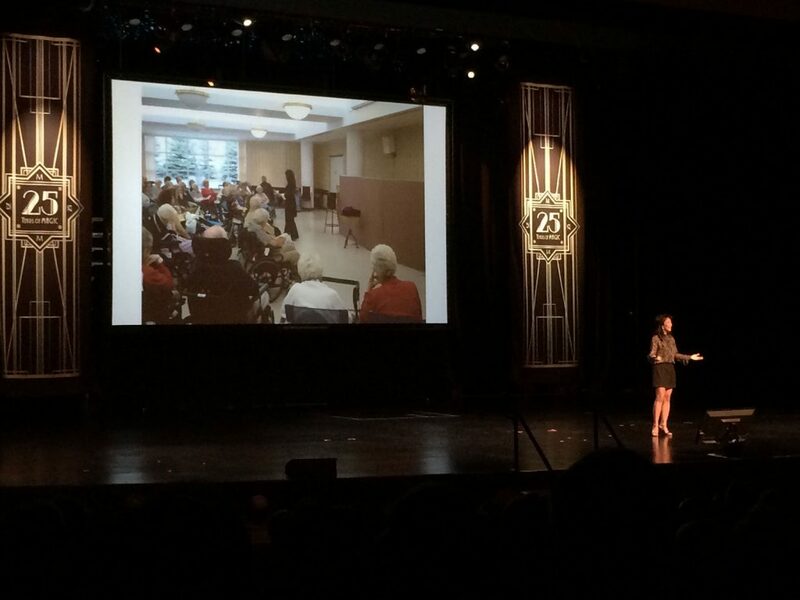 Julie Eng lectures about her life story as a magician and the work she does with Magicana. Martin Lewis – He is one of the most clever inventors in the magic field. 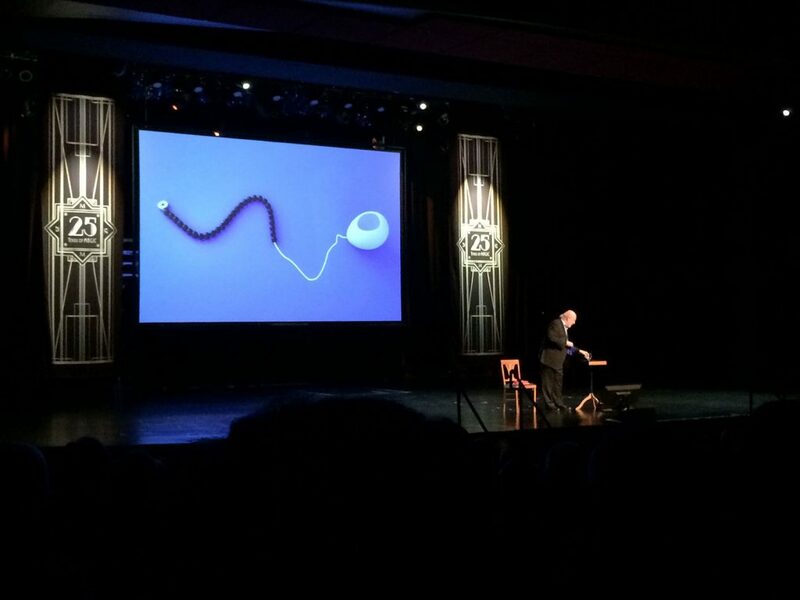 His lecture was mostly on the Gravity Pull and the many applications of that clever gimmick. Martin Lewis shares the secrets of his gravity pull. Master Payne – Has quirky views and humorous observations on magic. 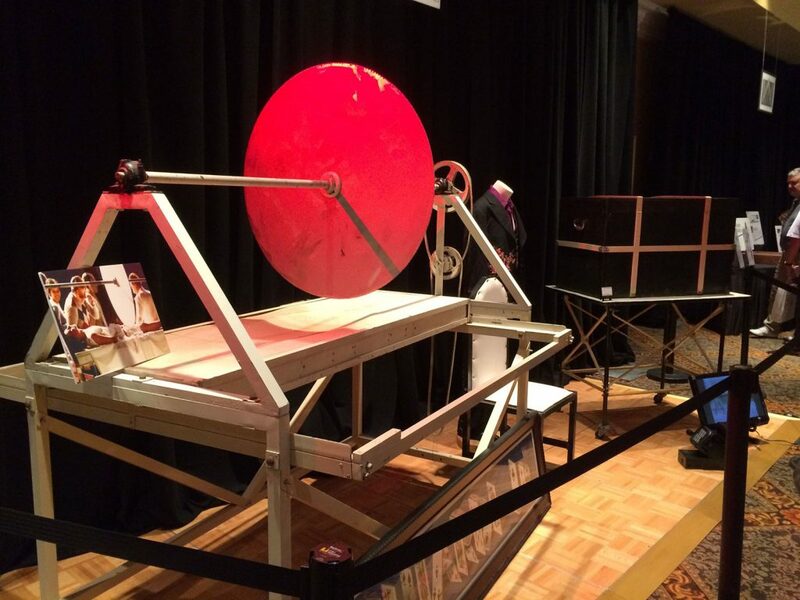 Mike Elizalde – The owner of Spectral Motion, a company specializing in special effects for film and live productions, talks about his field and the effects that he and his team produce. 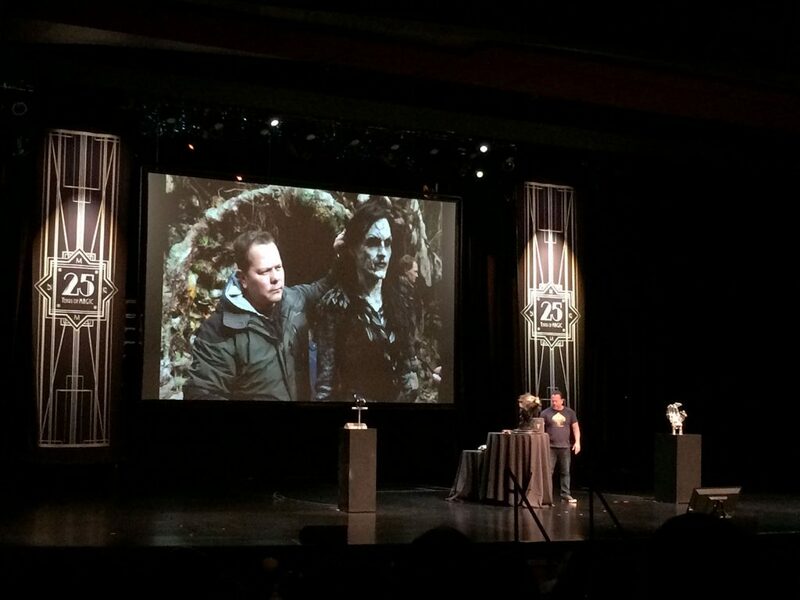 Mike Elizalde lectures on the special effects he does for movies. 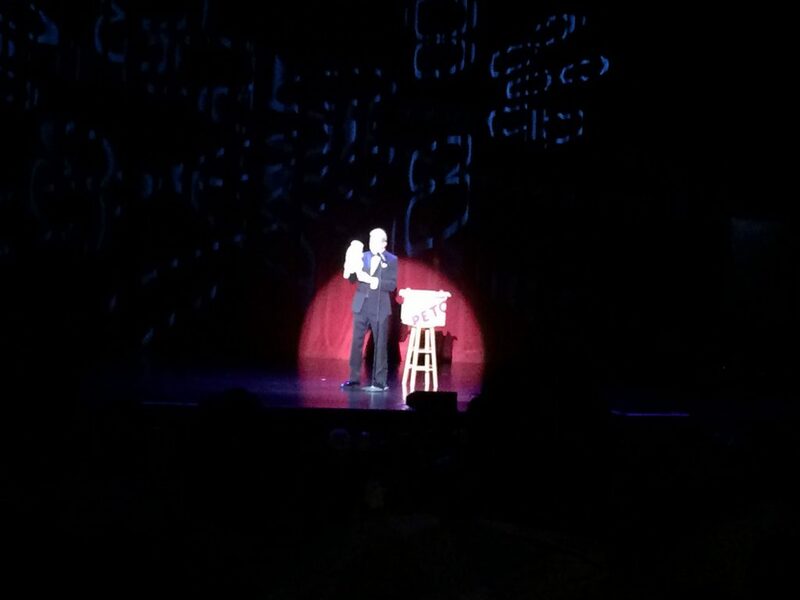 David Copperfield – Introduces living legend Marvyn Roy, who has donated his act and props to the David Copperfield Museum. 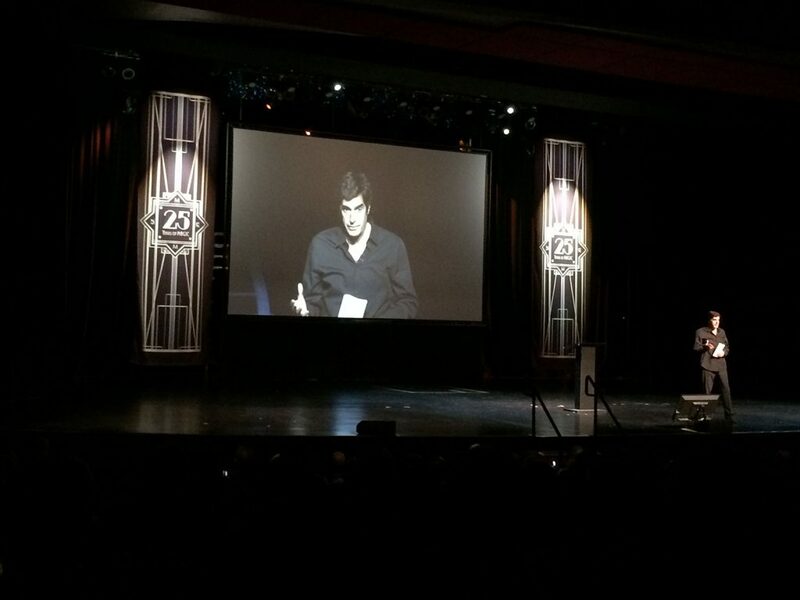 David Copperfield introduces living legend Marvyn Roy. 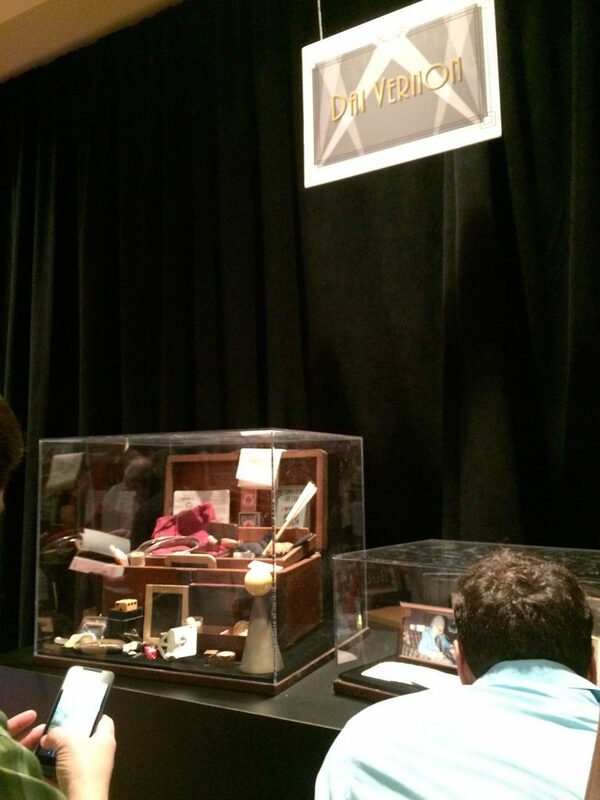 Marvyn donates his act to the David Copperfield Museum. 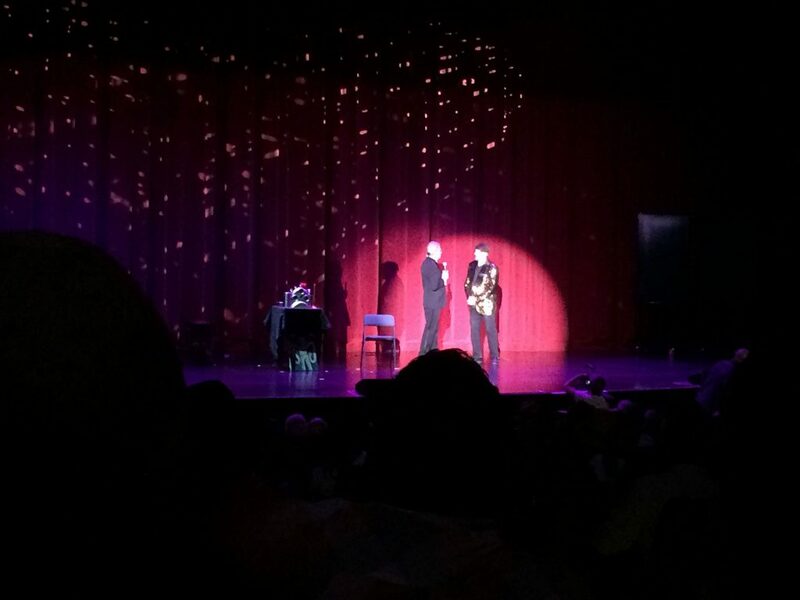 Johnny Thompson and Penn Jillette – Performed “The Gambler’s Ballad”, and theatrical piece about gambling, cheating and cards. 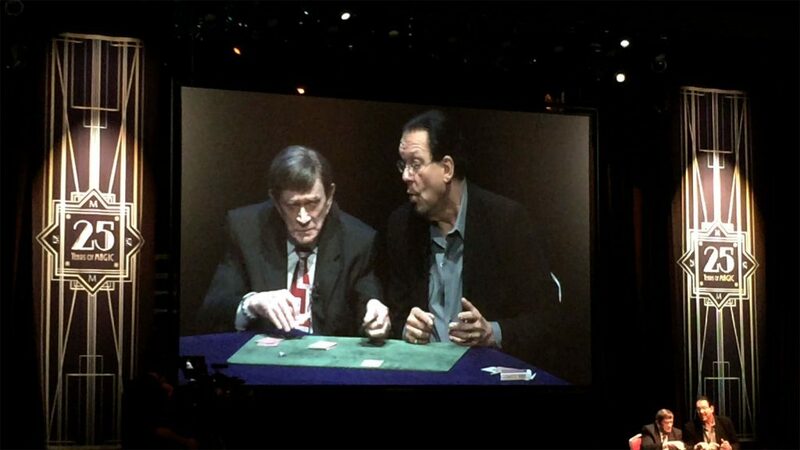 Johnny Thompson and Penn Jillette perform “The Gambler’s Ballad”. Again, after the general session, I dutifully hung out at our booth for the afternoon, missing the three main lectures for the day. Guess who visits me at the booth: The Amazing Cardin! Daryl – Teaches three practical magical effects. Rafael – Magician from Belgium, has a lecture on family entertainment. 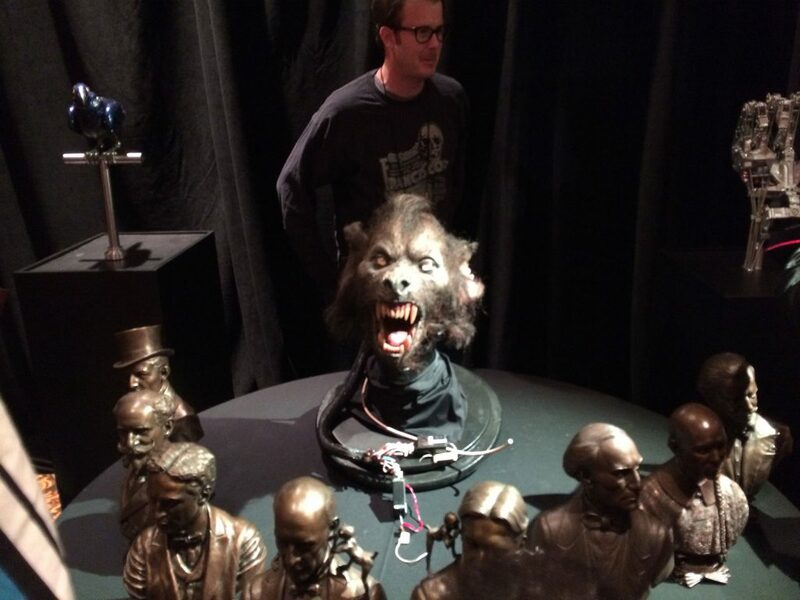 The Magic Museum – This was the HIGHLIGHT of the entire convention for me. My friend Lynetta Welch was the curator and organizer for this event. 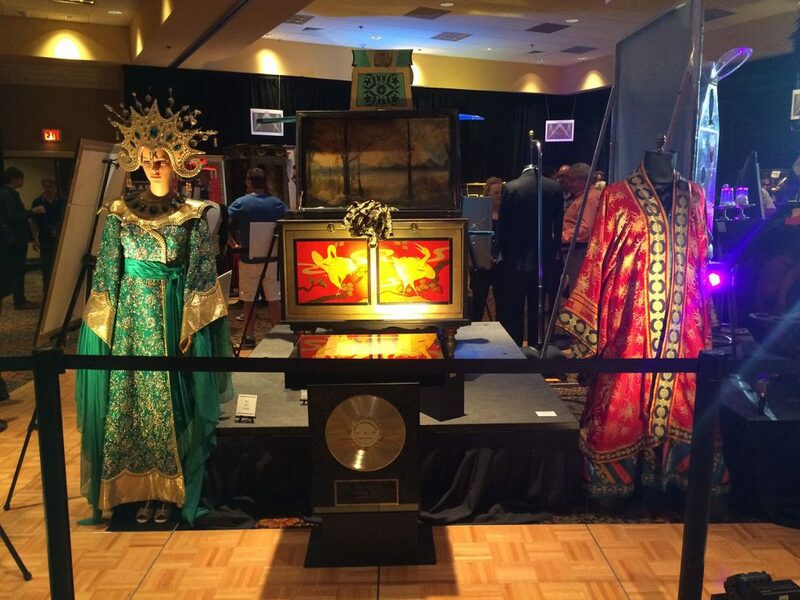 The idea was to create a museum at the convention with exhibits featuring historical pieces from magic’s past. 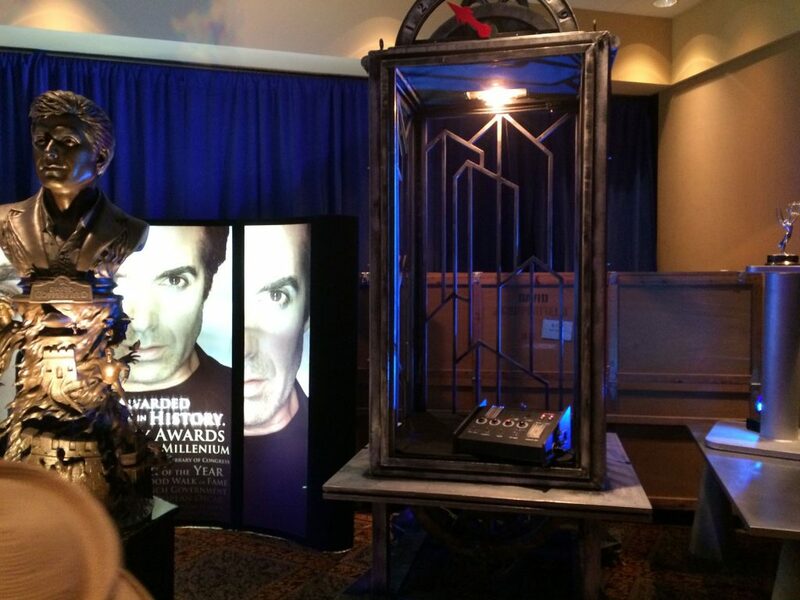 Exhibits included: David Copperfield’s – Elevator Illusion and Laser Illusion. This exhibit was amazing, and this is probably the only time ever that these pieces will be on display in one spot. 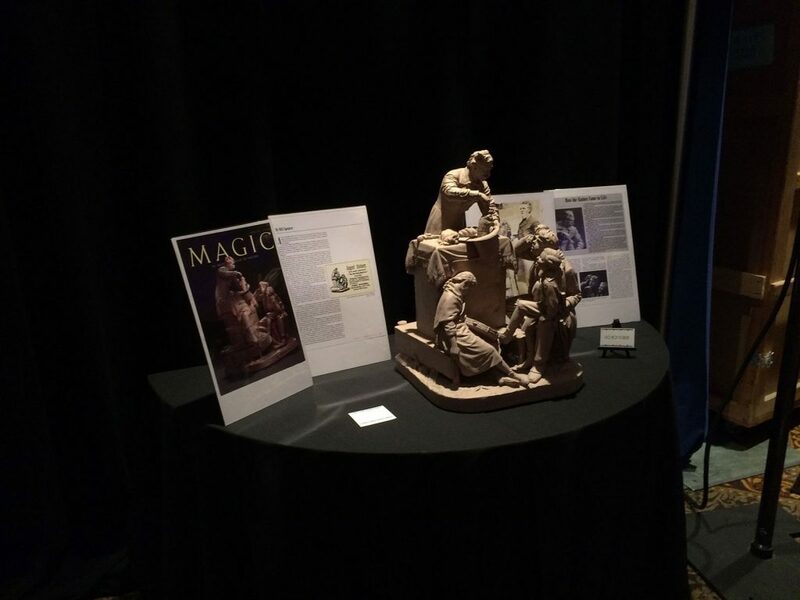 Contributors to the exhibits were David Copperfield, the Blackstone Estate, Mike Caveney, Chip Romero, Marvyn Roy, Norm Nielsen, Magic Magazine and others. For one night, this incredible museum “comes to life”. Once the evening is over, like magic, it disappears. The entire exhibit which took months to prepare was struck at the end of the night. 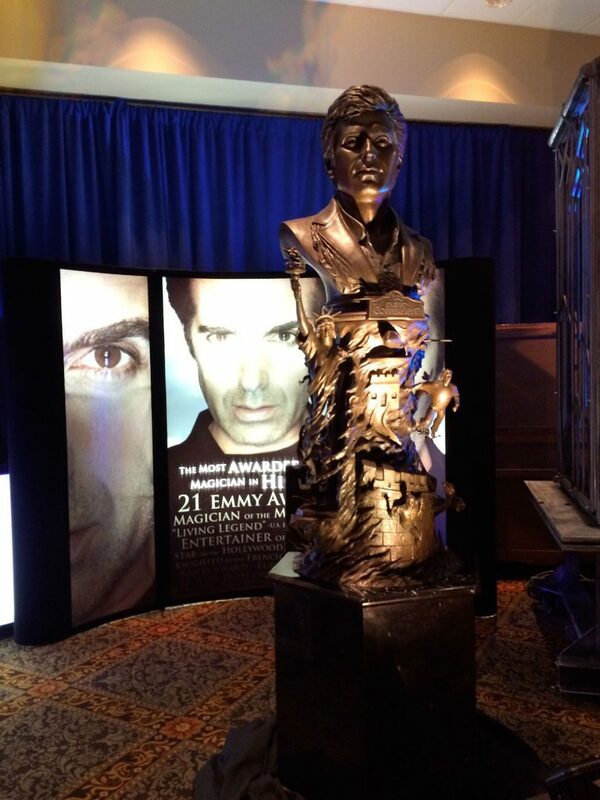 Bronze statue of David Copperfield. Thurston / Kellar Wand. 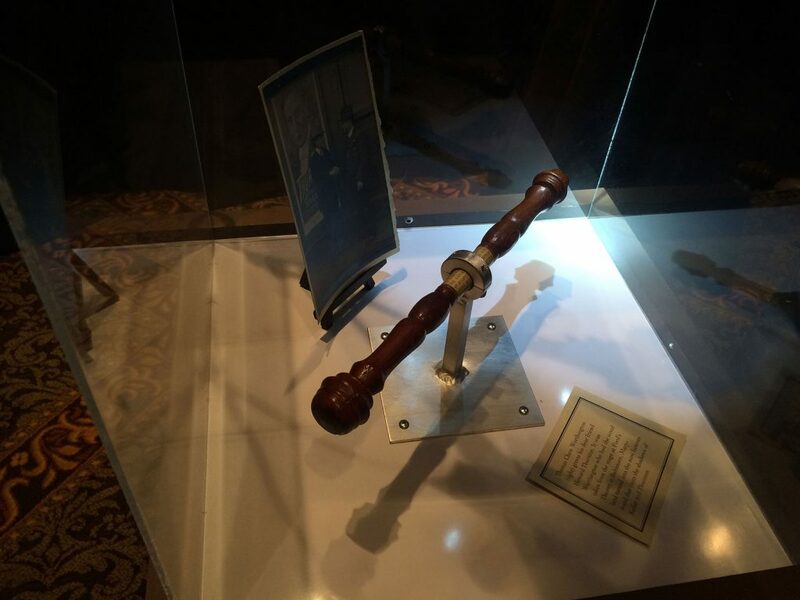 A commemorative wand made in 1908. Norm and Marvyn holding court at the Museum. This is a special photograph. Norm and Marvyn Roy are the last ones of their kind. You will never see their perfect acts again. 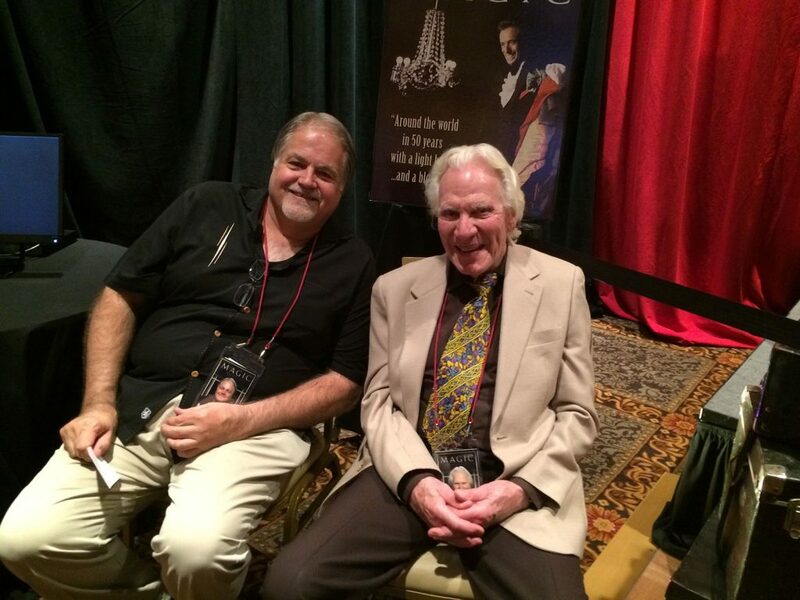 Norm Nielsen and Bill Smith hanging around. 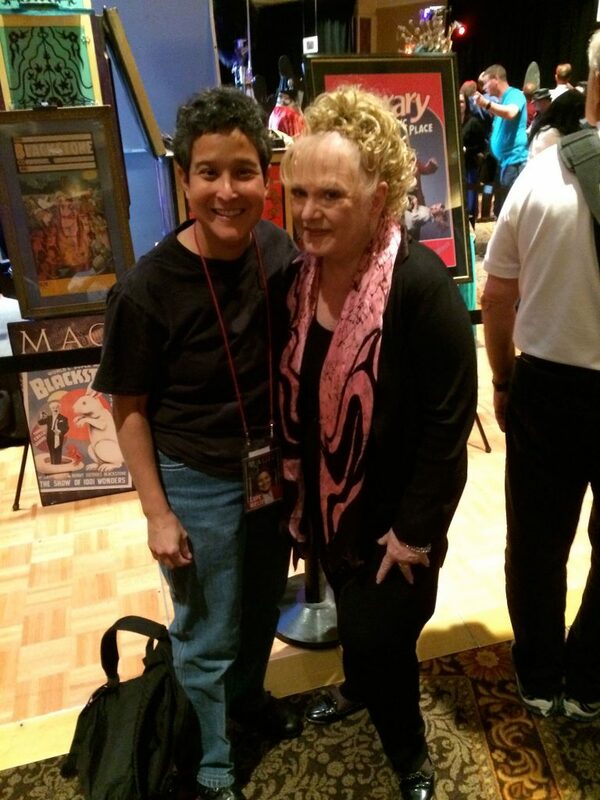 Yours truly with the legendary Gay Blackstone. An event I missed was called “The Game”. I didn’t know anyone that attended it, but I think it was a trivia contest about the content of the magazine. This took place in another ballroom. Michael Weber – Presentation on “The Drink that Schooled Einstein”. This is a variation of an effect known as the Jackpot Coins or the Trick that Fooled Einstein. Michael lectured about the history of the trick and performed a clever variation using liquids. It did fool everyone at the theater and will be fun to add to one’s repertoire. Michael Weber – “The Drink that Schooled Einstein”. Ken Weber – He is the author of “Maximum Entertainment” and lectured about how to raise the level of your performance, by using the proper stagecraft. From the correct lighting, sound, importance of scripting to avoid unnecessary words, etc. Everyone could benefit from his advice. Bizarro – Did a skit called “The Magic Shop”, to demonstrate how most magic props we see at magic shops do not make sense. 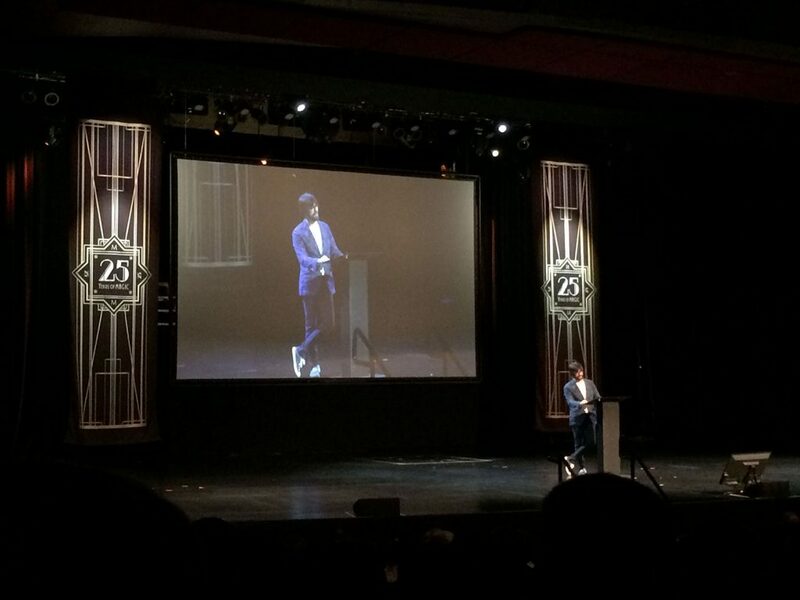 He emphasized the importance of giving your props a reason to exist and to be relevant to the act. Steve Spangler – He had a very, very clever lecture on how to get booked on television. Steve has been performing magic on TV for over thirty years. He knows the way producers think and how they pick material to be on a show. Steve cleverly disguised his magic and became the “science guy” on TV, and had segments with physical experiments in several affiliates in his area. All the techniques he lectured about were brilliant and a common sense approach to be on television or any other venue if you put your mind to it. 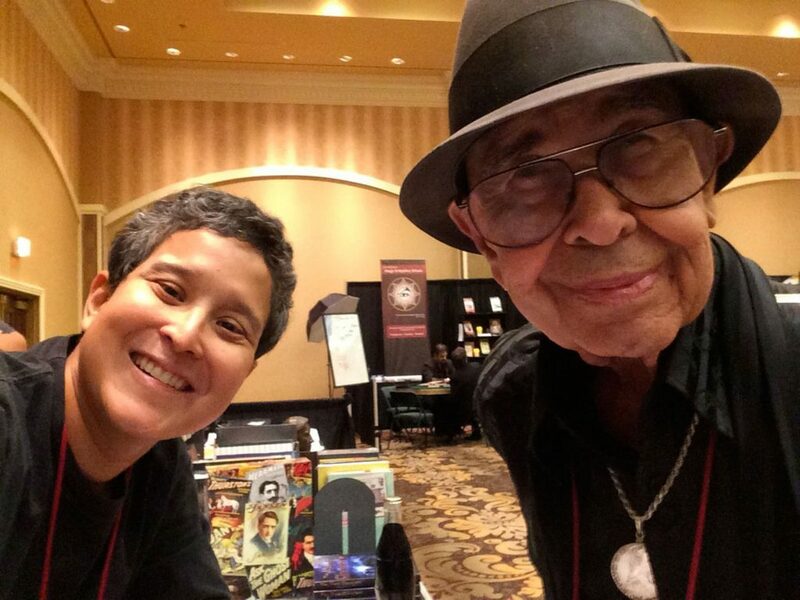 Curtis Hickman – Lectured on Virtual Magic. He is the co-founder of The Void, which is an immersive virtual reality experience. It seems that this might become the next new thing in entertainment for the future. 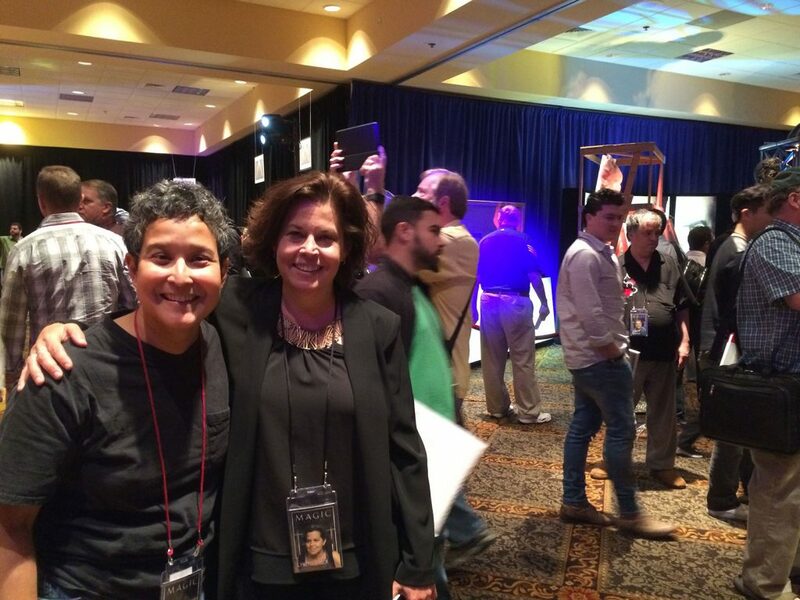 After the Sessions, again… I was perched to our dealer booth, and I did not move away! Guess who came by our booth? Wayne Dobson! Navaris Darson – A lecture about improv skills for magicians. Close-up Clinic – A clinic composed of nine performers teaching different aspects of close-up magic. Coins, three shell game, cards, etc. The teachers were Allan Ackerman, Jason England, Tom Frank, Paul Green, Pit Hartling, Eric Jones, Bob Kohler, John Lovick, and R. Paul Wilson. These were hands on clinics where attendees were encouraged to bring their props. I was fortunate enough to have a group of friends that arrange a fancy well deserved meal after striking the booth. Joseph Gabriel – Opened the show with his classic dove act. He is a very charismatic performer that delighted the audience with his grace and skill. Joseph Gabriel performing his bird act. The only illusion in the show tonight. Mark Kornhauser – Performed his unique brand of magic comedy, and performed a hilarious routine with a talking dog. 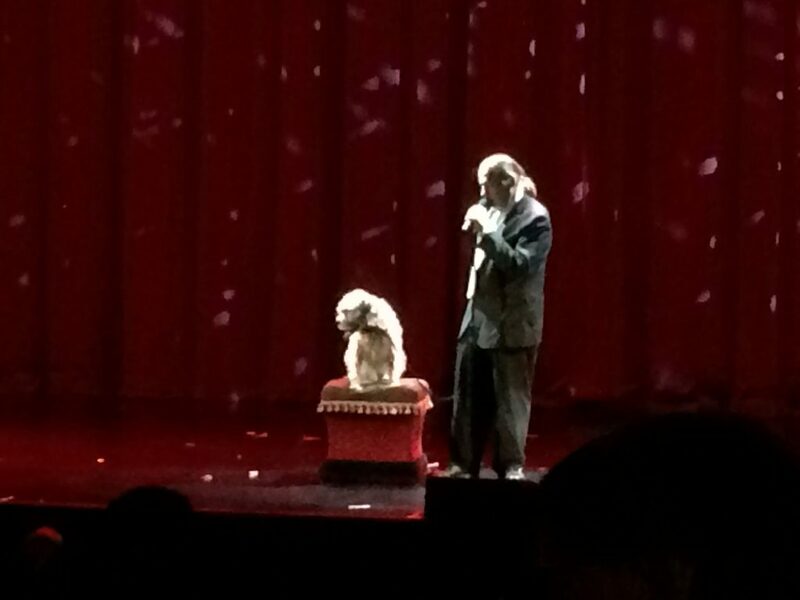 Mark Kornhauser and his talking dog. Axel Aldercreutz from Sweden performed a “three-legged” man routine, that looked magical and eerie. Thommy Ten and Amelie performed next. They did a two way mental act, and they proved why they are one of the most successful acts of this kind in the world. Their means of communication was undetectable and it looked like real mind reading. They are one of the few two way acts with an “ending” bit. Four performers followed: Marco Zoppi (a bubble act), Rafael (a magic comedy act), Tom Burgoon (magic comedy) and Chang Min Lee (Korean manipulator). They were all good and solid acts. My only feedback was that due to the music, lighting, and various themes (and the fact that I was bone tired), the pacing became slow at this time in the show. Chang Min Lee was extremely skillful, but his music was so flat with no drama that the act became quite boring to me. 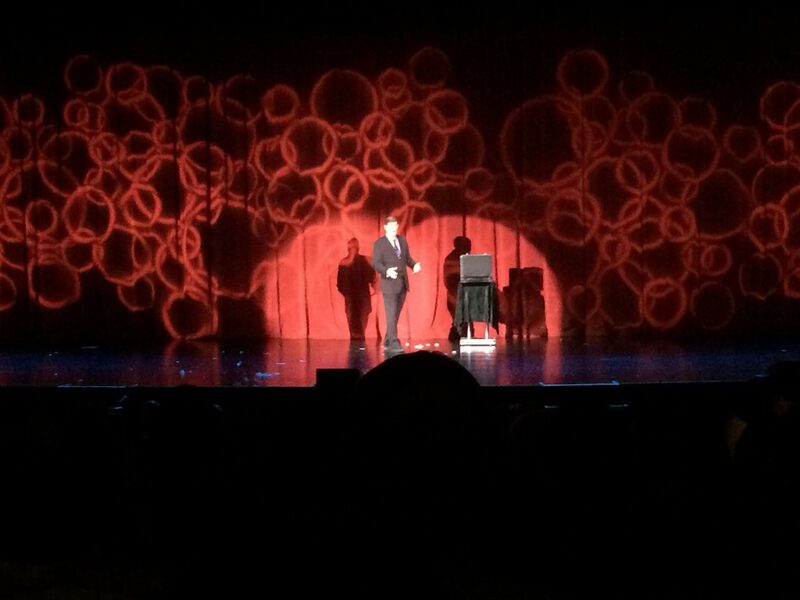 Raymond Crowe came next with his delightful “Shadow Act”, which is a classic, and closed the show. My observation on this show was that the pacing truly slowed down for the last forty minutes of the show. 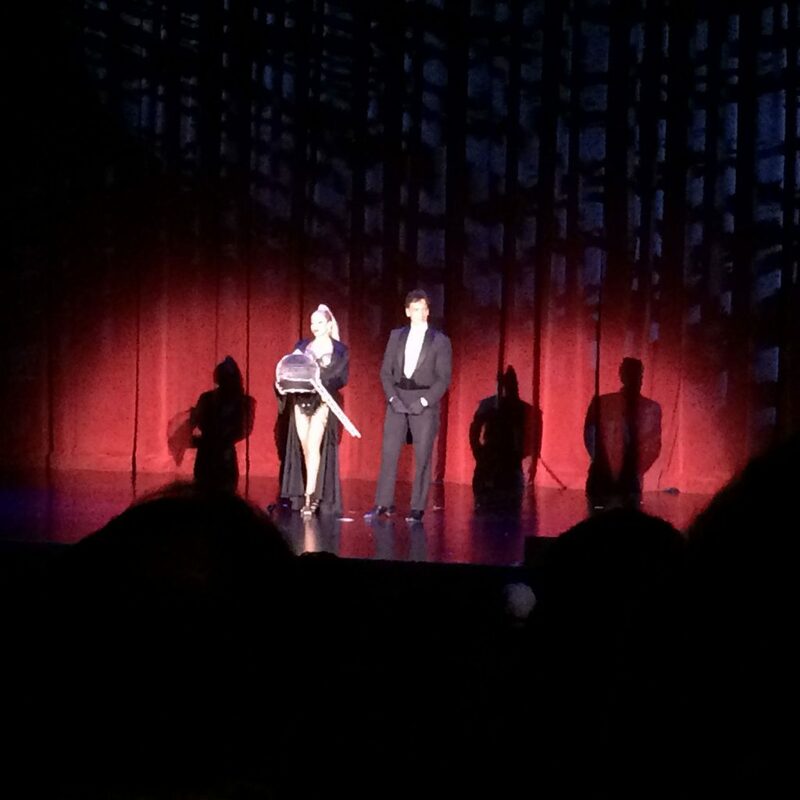 Although Raymond is quite a likeable and talented entertainer, IMHO, you don’t close a final gala show with a shadowgraphy act. Something was missing at the end of the entire show. 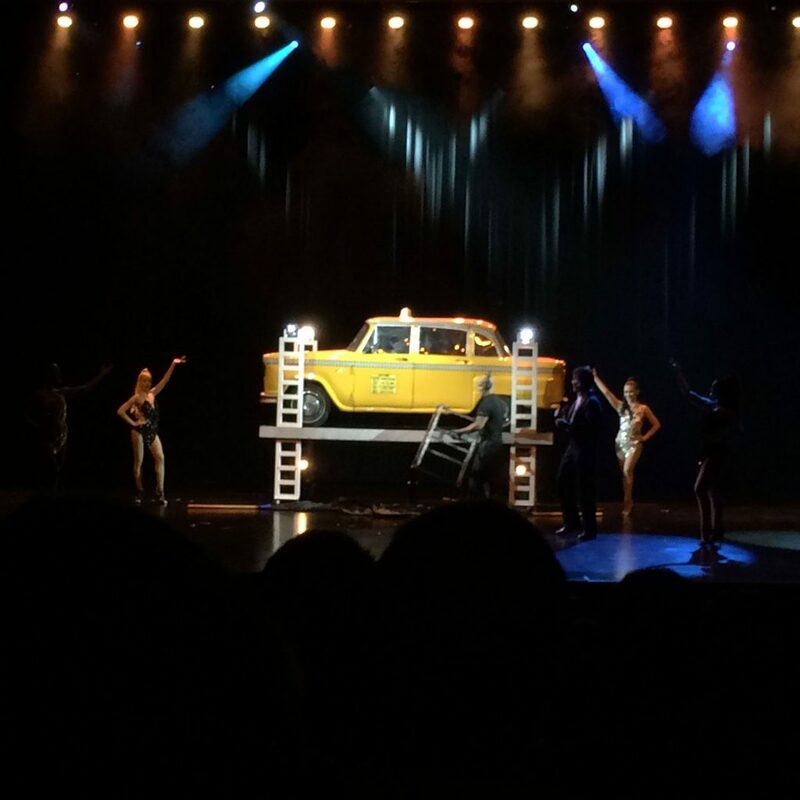 I somehow missed the spectacle of grand illusions or of the unexpected, Except for the appearance of the MC from a taxicab by Joseph Gabriel at the beginning of the show, there were no large illusions to be found in this show. After the show, it was party time! The final party was at the Mardigras Ballroom and it was packed. There was a light Italian pasta meal offered, along with various cash bars throughout the premises. The highlight was the gathering of most of the magicians that had appeared on the cover of Magic Magazine in the past twenty-five years. 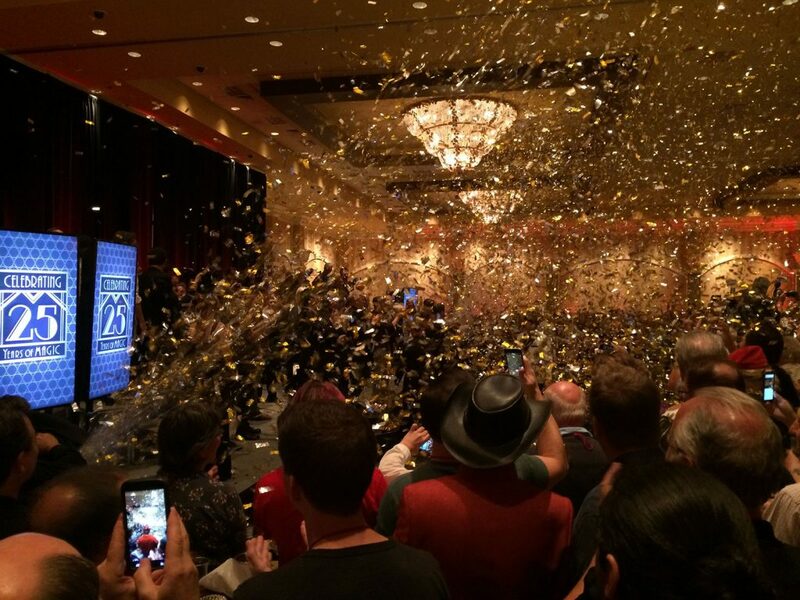 It was a great way to close an amazing convention. 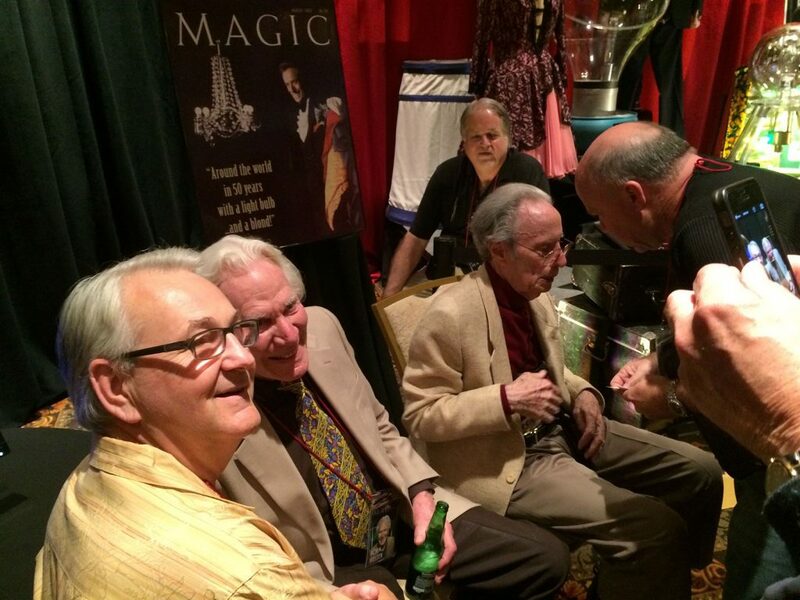 Performers that have been on the cover of Magic Magazine line up for a final photograph. In my opinion, this is indeed the best magic gathering in the world. 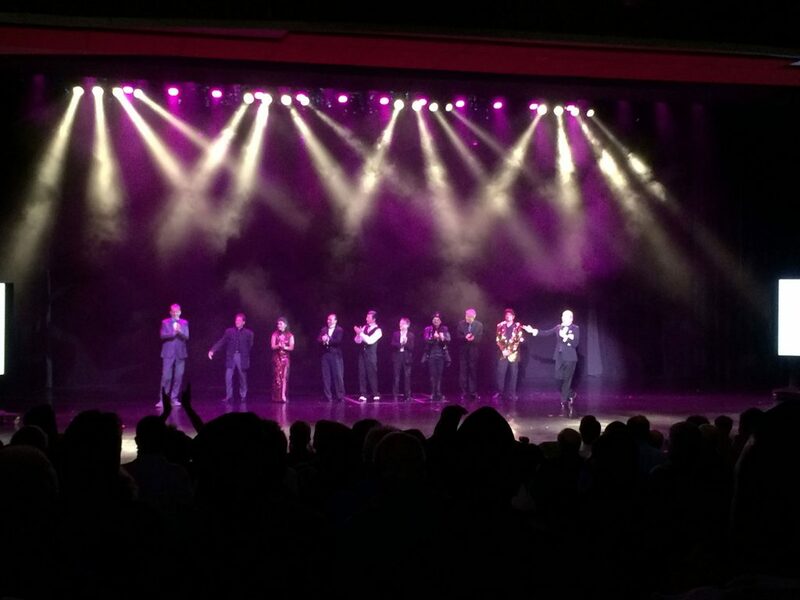 Nowhere else will you see more talent, more famous names, and more magic than in Magic Live. The event was extremely well organized, and everything moved like clockwork with precision and on time. It was a well oiled machine. This is the first year when I had to deal with our business alone. A couple of friends lent me a very helpful hands, but Norm did not help me this year, and frankly I miss him working in the business. I could barely take off to check out a few of the lectures. Times are changing. Entertainment is not the same anymore. We have a completely new generation of performers with a different aesthetic. Long gone are the venues from the past where performers could hone the perfect act. Performers are now working on the next new thing everyday to put on YouTube or the internet. This hit me during the In Memorian segment of the convention, in which they show all the people that have passed away in the last few years. The talent that is gone will never be seen again. 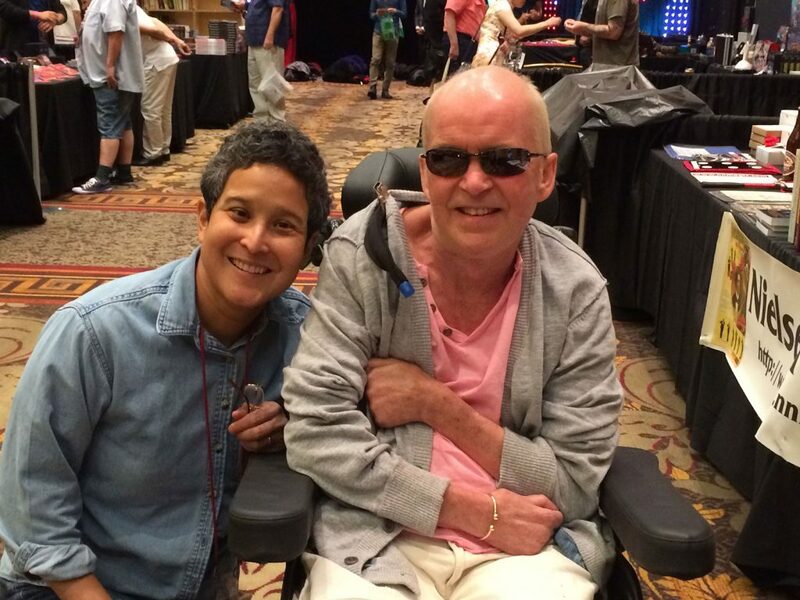 Many of them were my friends and mentors, and having a convention without Tom Mullica’s humor, or Irene’s smile, or Billy McComb’s advice, or Jay Marshall’s presence is simply not the same for me. I have gone to way too many conventions and seen so much magic, that there is very little that is new or surprising anymore. I no longer value the tricks, but I am more intrigued by the people behind them and the human aspect of it all. I have changed. I am older now. Would I keep coming back to the next Magic Live? You bet! As soon as registration opens next time for 2018, I will probably be the first in line. I have been in magic for over forty years. As much as I sometimes fight it and do something else for a little while, magic and magicians are my family, and I know hundreds of them – mostly delightful people that refused to grow up. It is a wonderful group of people to hang out with, having a common purpose to impress, delight, entertain and create wonder.